The Board of Trustees for the Library has identified the need for sustainable, ongoing levy funding to replace one-time donation support from 2014. This will help avoid significant reductions in services and allow the library to better meet its mission of lifelong learning, cultural literacy, and bringing the community together. The Ferguson Municipal Public Library District Board of Trustees has placed a levy funding request on the April 3, 2018 ballot in Ferguson, MO to increase the library levy by $0.18 per $100 assessed valuation over the current rate of $0.22, bringing it to $0.40. This is projected to increase the library’s current anticipated tax revenue of approximately $386,000 by $324,000 to $710,000 for FY 2018-19. FY 17 – 18 budget is $562,500 (with $463,500 from levy and other revenues plus $99,000 from donation reserves). You must be registered to vote by March 7th. Thanks to one-time donations in 2014, the Ferguson Municipal Public Library District has been able to operate on a higher budget than previously possible. This funding has allowed library staff to dramatically increase programming, make upgrades to the building that were 20 years overdue, improve collections for all ages and interests, and be much more responsive to the needs of Ferguson residents. If the measure were to pass, these efforts could continue after the 2014 donations run out–keeping the library responsive and able to offer robust services while also allowing new services that the library cannot currently afford. The library and its Board have been careful and prudent to make the most impact with those one-time donations and would continue to be careful and prudent with more secure and predictable funding. With the one-time donation money received in 2014, the library has been able to increase substantially the number of library programs from one program per year to multiple programs per month. The library has been able to invite local cultural institutions like the St. Louis Zoo, St. Louis Science Center, and the Magic House; hold computer and coding classes for kids and adults; sponsor a FIRST Robotics Lego League team; organize holiday-themed events; provide opportunities for our community to connect with each other through book clubs and craft programs; and much more, all for free. Since the one-time donations in 2014, the library has changed its staffing from largely part-time (excluding the library director) to include full-time and part-time employees. This has improved quality and consistency of service and allowed the library to complete many long-term projects to improve the library space and its services. If the levy is approved by voters on April 3rd, the library anticipates hiring a full-time adult services librarian to provide reference services for all patrons including entrepreneurs and small business owners, students, professionals, and job seekers. This librarian would enhance adult programming to better fulfill the needs of our adult population, including seniors, and improve services to homebound and differently-abled patrons. In addition, the library anticipates hiring additional part-time staff to provide more efficient and effective customer service to patrons of all ages and interests. Furthermore, the board anticipates evaluating salary and benefits for library employees to attract excellent staff that can provide quality service to Ferguson citizens. In the past few years, the library has been able to provide a wider selection of materials, replace outdated and unwanted materials, and greatly improve the consistency and quality of the library catalog. Because the Board did not want to become dependent on one-time donation money for regular operations, the library maintained previous budget amounts for books, movies, and music. In 2015, the library was able to replace and expand public technology options using grant and donation money, replacing 10 outdated computers with 17 new desktop PCs, a laptop lab, and a smartboard. This dramatically improved the library’s ability to help Ferguson citizens cross the “digital divide,” which causes those unfamiliar with technology to struggle in a computer-centric world. The library is the one place in town that allows those without home internet access the ability to apply for jobs, use social media, or search for information. At the library, seniors, lower-income families, and those unfamiliar with technology can access technology at no cost and gain fluency to navigate the new digital age. 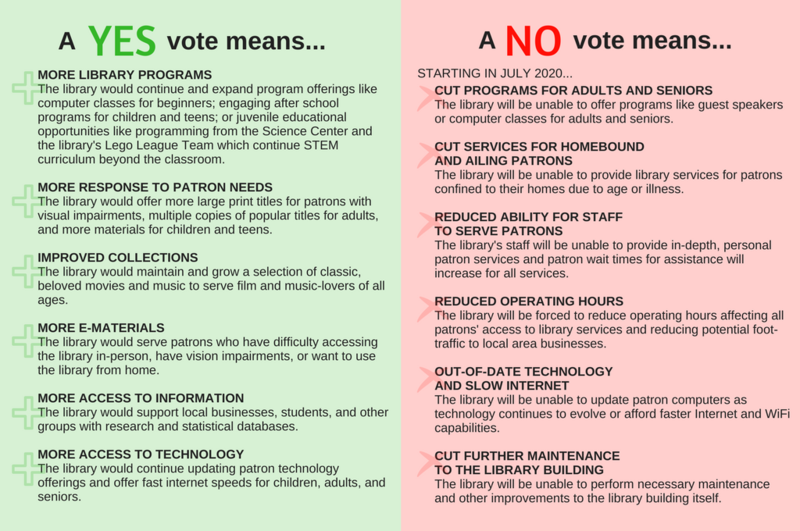 If the levy is approved by voters on April 3rd, the library anticipates beginning a 4-year technology replacement cycle. This replacement cycle ensures that library patrons can have access to fast, functional, and well cared for public computers. As technology evolves, the library can upgrade offerings, preventing Ferguson citizens from falling on the wrong side of the digital divide. Additionally, this replacement cycle allows the library to offer other technologies as they emerge. The Board directed much of the one-time 2014 donation money to making the library safer and more inviting, making improvements that were a decade or more overdue. These improvements include installing handicap-accessible front doors, renovating the library’s bathrooms, replacing two 20-year-old HVAC units, replacing ripped and mismatched carpet throughout the building, and introducing modular and attractive tables and chairs. Further funding would allow the library to continue making prudent and significant upgrades which increase the utility and value of the physical space for all patrons. The one-time donations in 2014 have allowed the Ferguson Municipal Public Library District to expand services, while also completing long overdue improvements to the building itself. These one-time donations are projected to last for another two years. The library board anticipates to budget at current funding and donation levels for as long as possible. If the levy is not approved on April 3rd, the library anticipates making the following changes to services within existing funding (current 1995 levy funding and remaining 2014 donation support). The library anticipates extending the life of the one-time 2014 donations as much as possible and belt-tightening reductions throughout the library budget. Small fundraising will continue with no guaranteed result. Library services at existing capacity would continue into June 2020. However, staff professional development will be curtailed or eliminated. 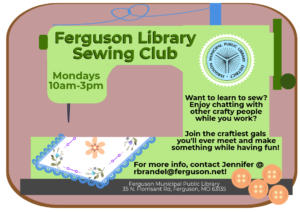 The library will be less able to provide service to Ferguson residents as staffing is reduced significantly. Long-term collection improvement projects will become difficult to conceive and complete–causing the collection to no longer grow and evolve with patron interests and needs. The library will have fewer staff members and a reduced ability to attract quality full-time or part-time staff members. The library will have to reduce the hours it is open. The library will rarely replace aging computers and the overall quality of technology maintenance will be reduced. The library will be unable to perform necessary maintenance and other improvements to the library building itself.